If you haven't had your running gait assessed in a while, pop into your local running store and have them do an assessment for you. 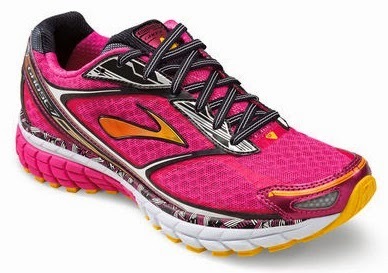 I had been running in the Brooks Adrenaline GTS 14 for a while. After having a lengthy discussion with the manager at the running store + a gait analysis, he determined that the GTS 14 was not right for me. The GTS 14 is mainly a stability shoe and since I don't have any issues with pronating, I don't need a stability shoe. WOW! That is a lot of important info. This shoe is awesome and perfect for me! Also, at 8.6 ounces, versus the 9.4 ounces for the GTS 14 - this is a lighter shoe, while still giving me great cushion out on the roads. Make sure you are running in the shoe that is right for you. Leave a comment below - what shoe are you currently running in? Did you have a gait analysis before you purchased the shoe?